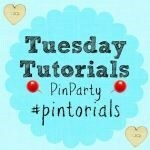 A huge welcome to Week 10 of the Tuesday Tutorials Pintorials Pin Party! Last week, I went to attend a craft event where I got to learn two simple crafts made from fabric and so this week I am going to feature fabric ideas. I love how Mosswood Connections made use of pieces of lightweight fabric to make this gorgeous bowl which makes a great home-made gift! Next is Vicky Myers Creations who made these interesting machine embroidery and papier mache pictures! It looks very pretty! I think they look great on a wall! Lastly is my very own fabric book cover. You can make this cover in any sizes as long as you have enough fabric! Do check it out! Don’t forget to pop by to take a look at Kate (Upcycling activities for kids) , The Boy and Me (STEM) and Hodge’s blogs to see who is featured this week.